SAGINAW, MI - The Bay College Baseball Team (9-14-1) would struggle offensively and drop a doubleheader to the Delta College Pioneers (13-16-1) by finals scores of 3-1 and 8-0. Both offenses would be kept off balance by the starting pitchers. It would be the Pioneers that would strike first in the third inning, as Andrew Gauthier (FR, Shepherd, MI) would hit a deep fly ball to right that would carry over the fence for a solo homerun. A leadoff double in the fourth would bite the Norse, as Carson Longstreth (FR, Beaverton, MI) would score on a throwing error after a well-placed Pioneer bunt. Nick Johnson (FR, New Lothrop, MI) drove in a run in the fifth, and Delta would lead by three. The Norse would see a baserunner in every inning, but would not be able to take advantage. A pair of leadoff walks in the seventh would be the best threat for the Norse. Ben Schwalbach scored on a wild pitch in that inning, but a groundout and two strikeouts would end the comeback attempt. Jack Rossbach (FR, Howell, MI) was impressive in his start for the Pioneers. He would go six plus innings and give up just three hits, the one earned run, walk four, and strike out one. Alex Dingee (FR, Bay City, MI) pinned down the save, securing the final three outs. Longstreth ended up with a two for three game with a double and a run scored. Tyler Skufca (SO, Escanaba, MI) would be tagged with the tough-luck loss despite his strong performance. He gave up seven hits, one walk, and just two earned runs in six innings of work. Oliver Dunn (FR, Melbourne, Australia) collected two hits in three at bats. Seven hits would not be enough offense to put runs on the board for the Norse as they would strand runners in each of the first four innings. An error and a walk put runners on first and second with no one out in the fourth. The Pioneers would use a well-designed pickoff move to get the runner at second, and then proceed to catch the runner trying to steal second to snub out the rally attempt. Delta took the lead in the third, scoring with two outs on a wild pitch. Braeden Lamberg (FR, Gladstone, MI) executed a squeeze bunt in the fourth to send another runner home, and Delta would hold a two-run lead. The home team would pile on in the bottom half of the sixth. An error would get things going, followed by a pair of singles. Lamberg drove in a second run with liner to center. Another error would extend the inning, and Longstreth would drive in a run with a single, and Jackson Lund (FR, Big Rapids, MI) doubled in two more. When the Norse were finally able to get out of the inning, they had surrendered six runs. Bay would strand two runners on in the seventh, but the Pioneers would close out the game, finishing the shutout. Alex Snider (FR, Auburn, MI) got credit for the complete game shutout, going the distance and scattering six hits and two walks while striking out six. Longstreth finished two for three with an RBI, run scored, and double. Cam Floyd (FR, Pinconning, MI) also collected two hits in three at bats. Logan Bailey (FR, Sault Ste. Marie, MI) took the loss for the Norse. He went the distance, giving up nine hits, two walks, and only three of the eight runs were earned. He would strike out four. Skufca ended the game two for two. The Norse currently have a break in their schedule, but are looking to fill a void in the next two weekends. The original home opener on April 19 was cancelled due to UW-Barron County cancelling the rest of their season. Bay is currently in search of a team to fill that void. The next scheduled games are on April 26 when they travel to Century College in Minnesota. They will then play a four game series with Dakota County Technical College, the first three of which will be a part of a seven game series that will determine which of the two teams will advance to the NJCAA Region XIII Tournament. SAGINAW - The Bay Norse Baseball Team (9-12-1) faced off with the Delta College Pioneers (11-16-1) on Sunday afternoon for the first half of a four game series. 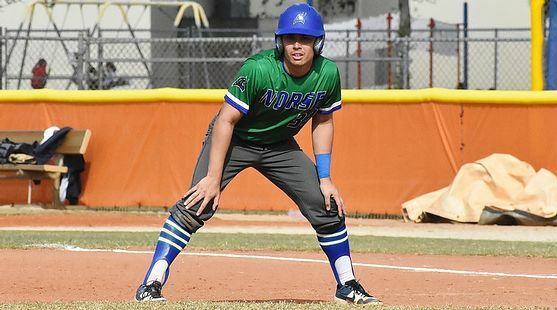 The two teams would split the first doubleheader with the home standing Pioneers taking an early lead in the first game, and quiet the Norse bats for a 6-1 win. The Norse would use a big second inning in the nightcap to even the series with a 10-7 victory. The Pioneers would use a big first inning to take control of the first game of the series. Three consecutive singles would send the first two runs home, with Nick Johnson (FR, New Lothrop, MI) driving in both of them. Carson Longstreth (FR, Beaverton, MI) followed that up with a two-run homerun to left, putting the Norse down four before they could even record an out. Andrew Gauthier (FR, Shepherd, MI) hit a pop fly single into right to drive in the fifth run of the inning with one out. Bay would get out of the jam and avoid what could have been an even bigger inning by inducing a pop out and then catching a runner straying too far off of second for a pick off to end the inning. Johnson would lift a sacrifice fly to right to add a run in the second, and the Pioneers held a 6-0 lead. Meanwhile the Norse would struggle to string together hits. They would leave Flynn Morrison (FR, Melbourne, Australia) stranded after he led off the second with a double, and leave runners on in the third and fourth. Tyler Skufca (SO, Escanaba, MI) led off the fifth with a double, and came around to score on a Jeff Allen (FR, Watervliet, MI) line drive single to center, but that would be all the offense the Norse could muster. Justin Popelka (SO, Escanaba, MI) would settle in nicely after the rough first inning. He gave up nine hits, six of which were in the first inning. He walked one, hit one batter, and struck out one, taking the loss on the mound. Skufca went two for three with two doubles. Allen also collected two hits, in two at bats, and the lone Norse RBI. Andrew Sills (FR, Birch Run, MI) was brilliant for the Pioneers, pitching a complete game and scattering seven hits. He struck out seven and walked no one. Cam Fowler (SO, Bay City, MI) was two for three with two runs scored, while Longstreth would go two for three with a two RBI, one run scored, and that homerun in the second. Gauthier also collected two hits, in two at bats, with an RBI. The Norse would take the lead early in game two, with Mark Zhang (FR, Canberra, Australia) blasting a solo homerun to left. The Pioneers answered back in the bottom half with two runs. Randy Rangel (SO, Saginaw, MI) picked up the first RBI, and Johnson would steal home in a double steal situation, giving Delta the lead. Bay would make that lead short lived. With one out Pioneer pitching would walk two hitters, and hit another to set the Norse up with a bases loaded situation. After a pop up in the infield, it looked as though the home team may get off the hook, but a four pitch walk would tie the game. Oliver Dunn (FR, Melbourne, Australia) would make sure Delta would pay, as he would drive a double to deep left field, clearing the bases. Dunn scored on an error, and Zhang would slide head first to score another run off of a passed ball, giving Bay a 7-2 lead. Delta had an answer in the bottom of the second. Braden Lamberg (FR, Gladstone, MI) reached after getting hit by a pitch and scored on a base hit. An error and three more base hits tightened the gap, and Bay would escape the inning clinging to a one-run lead. The Norse loaded the bases in the third with no one out, threatening another big inning. Allen drove a fly ball to left to bring in a run, but a miscommunication on the bases would get a run thrown out at the plate on the ensuing ground ball. The Pioneers got out of the jam with a groundout to end the inning, and the Norse let a great opportunity slip away. Both teams would strand runners in their opportunities in the third and fourth. Bay would add precious insurance runs in the fifth. Ty Ziegler (FR, Hortonville, WI) singled through the right side to drive in a run, and with two outs Dunn singled in another run, giving Bay a 10-6 lead. Delta would get a leadoff double from Rangel in the bottom half, and Lamberg would come through with a single to drive him in, cutting the lead to three. The Pioneers would put together a threat in the sixth. With one out, back-to-back singles would chase Norse starter Kyler Moir (FR, Hillman, MI) from the game. Connor Olson (FR, Washburn, WI) stepped in and induced a groundball and a fly out to end the threat. He would also work around a leadoff single in the seventh, to seal the victory for the Norse. Moir earned his first career win by going five and one third innings. He would give up 14 hits, seven runs, six earned, and one walk while striking out one. Olson picked up the save, giving up just the one hit and striking out one. Dunn collected four RBI with his two for four performance. Ziegler picked up two hits in two at bats, scored once and drove in one. Fowler continued with his strong showing, going four for four in the second game with two runs scored. Rangel added a three for four game with one RBI and a run scored. Matt Fisher (FR, Bay City, MI) also had three hits in three at bats with two RBI. Johnson finished two for four with an RBI. The two teams will meet to finish off the series with a doubleheader at 2 pm on Monday afternoon.